Apple stamping is a great craft to celebrate the fall season and is perfect for toddlers on up. 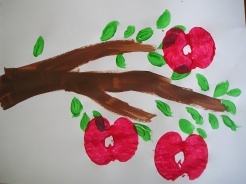 Made your apple painting into a place mat by covering it with contact paper! You will need to use a knife for this craft, make sure young children are supervised! 2. Pour some paint onto a paper plate and dip your apple into the paper plate. Stamp your appples on the paper in as many different fall colors as you'd like. Make your apple picture into a place mat by coving it with contact paper. Contact paper comes in a big roll for about $5. You find it where the drawer liners, sponges, mops, etc., are found. Click here to find more Fall Crafts like Apple Stamping!